Yellowstone National Park is a U.S. National Park located in the western states of Wyoming, Montana, and Idaho. It is the first and oldest national park in the world and covers 3,468 square miles (8,983 square kilometers), mostly in the northwest corner of Wyoming. The park is famous for its various geysers, hot springs, supervolcano and other geothermal features and is home to grizzly bears, wolves, and free-ranging herds of bison and elk. It is the core of the Greater Yellowstone Ecosystem, one of the largest intact temperate zone ecosystems remaining on the planet. The world's most famous geyser, the Old Faithful, is also located in Yellowstone National Park. Long before any recorded human history in Yellowstone, a massive volcanic eruption spewed an immense volume of ash that covered all of what is now the Western United States, much of the Midwestern area and northern Mexico and some areas of the Pacific Coast. The eruption left a huge caldera 43 miles by 18 miles (70 by 30 kilometers) sitting over a huge magma chamber. Yellowstone has registered three major volcanic eruption events in the last 2.2 million years with the last event occurring 640,000 years ago. Its eruptions are the largest known to have occurred on Earth within that timeframe, producing drastic climate change in the aftermath. The result of these eruptions and ensuing natural development along with the effects of climate, is one of the most breathtaking and awe-inspiring locations in North America. Yellowstone can be called a textbook through which we can study development of the planet Earth through its various stages. We can also come to understand the nature of the Creator more fully, as a creator's character is revealed in the created being. Surely Yellowstone is a textbook worth studying and a park worth visiting simply to experience its vast sensory pleasures. The human history of Yellowstone National Park begins at least 11,000 years ago when Native Americans first began to hunt and fish in the Yellowstone region. These Paleo-indians were of the Clovis culture who used significant amounts of obsidian found in the park to craft cutting tools and weapons. Arrowheads made of Yellowstone obsidian have been found as far away as the Mississippi Valley, indicating that a regular obsidian trade existed between the tribes of the Yellowstone region and tribes farther east. By the time white explorers first entered the region during the Lewis and Clark Expedition in 1805, they encountered the Nez Perce, Crow and Shoshone tribes. While passing through present day Montana, the expedition members were informed of the Yellowstone region to the south, but did not investigate it. In 1806 John Colter of the Lewis and Clark Expedition left the expedition to join a group of fur trappers. Splitting with them in 1807, he passed through a portion of what later became the park during the winter of 1807-1808, and observed at least one geothermal area in the northeastern section of the park, near Tower Falls. After surviving wounds he suffered in a battle with members of the Crow and Blackfoot tribes in 1809, he gave a description of a place of "fire and brimstone" that was dismissed by most people as delirium. The supposedly imaginary place was nicknamed "Colter's Hell." Over the next forty years, numerous reports from mountain men and trappers told of boiling mud, steaming rivers and petrified trees and animals, yet most of these reports were believed at the time to be myth. After an 1856 exploration, mountain man James Bridger reported observing boiling springs, spouting water, and a mountain of glass and yellow rock. Because Bridger was known for being a "spinner of yarns" these reports were largely ignored. Nonetheless, his stories did arouse the interest of explorer and geologist F. V. Hayden, who, in 1859, began a two-year survey of the upper Missouri River region with United States Army surveyor W. F. Raynolds and Bridger as a guide. After exploring the Black Hills region of in what is now the state of South Dakota, the party neared the Yellowstone region, but heavy snows forced them to turn away. The American Civil War prevented any further attempts to explore the region until the late 1860s. The first detailed expedition to the Yellowstone area was the Folsom Expedition of 1869, which consisted of three privately funded explorers. The members of the Folsom party followed the Yellowstone River to Yellowstone Lake, keeping a journal of their findings. Based on the information reported by the Folsom Expedition, in 1870 a party of Montana residents organized the Washburn-Langford-Doane Expedition, headed by the surveyor-general of Montana, Henry Washburn. Among the group was Nathaniel P. Langford, who would later become known as "National Park" Langford, and a U.S. Army detachment commanded by Lieutenant Gustavus Doane. The expedition spent a month exploring the region, collecting specimens, and naming sites of interest. Cornelius Hedges, a member of the Washburn expedition, proposed the region be set aside and protected as a national park, and wrote a number of detailed articles about his observations for the Helena Herald newspaper between 1870-1871. Hedges essentially reinstated comments made in October 1865 by acting territorial governor Thomas Francis Meagher, who had previously commented that the region should be protected. In 1871, 11 years after his failed first effort, F. V. Hayden successfully returned to Yellowstone with a second, larger expedition supported by government funding. He compiled a comprehensive report on Yellowstone which included large-format photographs by William Henry Jackson and paintings by Thomas Moran. This report helped to convince the U.S. Congress to withdraw this region from public auction and on March 1, 1872, President Ulysses S. Grant signed a bill into law that created Yellowstone National Park. "National Park" Langford, a member of both the 1870 and 1871 expeditions, was appointed as the park's first superintendent in 1872. He served for five years, but without salary, funding, or staff, and thus lacked the means to improve the lands or implement any kind of protection to the park. Without any formal policy or regulations put into place, he lacked any legal method to enforce such protection were it available to him. This left Yellowstone vulnerable to attack from poachers, vandals, and others seeking to raid its resources. As a result Langford was forced to step down in 1877. Having traveled through Yellowstone and witnessed these problems first hand, Philetus Norris volunteered for the position after Langford's exit. Congress finally saw fit to implement a salary for the position as well as a minimal amount of funds to operate the park. Langford used these monies to expand access to the park, building over 30 new, albeit crude, roads, as well as further exploring Yellowstone. He also hired Harry Yount ("Rocky Mountain Harry") to control poaching and vandalism in the park. Today, Yount is considered the first national park ranger. These measures still proved to be insufficient in protecting the park though, as neither Norris nor the three superintendents who followed, proved effective in stopping the destruction of Yellowstone's natural resources. It was only in 1886, when the United States Army was given the task of managing the park, that control was able to be maintained. With the funding and manpower necessary to keep a diligent watch, the army successfully developed their own policies and regulations that maintained public access while protecting park wildlife and natural resources. When the National Park Service was created in 1916, it would take its lead largely from the army's successful example. The army turned control over to the National Park Service in 1918. Yellowstone was designated an International Biosphere Reserve on October 26, 1976, and a UNESCO World Heritage Site on September 8, 1978. 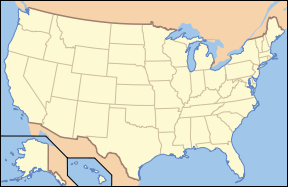 The Continental Divide of North America runs roughly diagonally through the southwestern part of the park. The divide is a topographic ridgeline that bisects the continent between Pacific Ocean and Atlantic Ocean water drainages (the drainage from one-third of the park is on the Pacific side of this divide). Both the Yellowstone River and the Snake River have their origins close to each other in the park. However, the headwaters of the Snake River are on the west side of the continental divide, and the headwaters of the Yellowstone River are on the east side of that divide. The result is that the waters of the Snake River head toward the Pacific Ocean, and the waters of the Yellowstone head for the Atlantic Ocean via the Gulf of Mexico. The park sits on a high plateau which is, on average, 8,000 feet (2,400 meters) above sea level and is bounded on nearly all sides by mountain ranges of the Middle Rocky Mountains, which range from 10,000 to 14,000 feet (3,000 to 4,300 meters) in elevation. These ranges are: the Gallatin Range (to the northwest), Beartooth Mountains (to the north), Absaroka Mountains (to the east), Wind River Range (southeast corner), Teton Mountains (to the south), and the Madison Range (to the west). The most prominent summit in the plateau is Mount Washburn at 10,243 feet (3,122 meters). Just outside of the southwestern park border is the Island Park Caldera, which is a plateau ringed by low hills. Beyond that are the Snake River Plains of southern Idaho, which are covered by flood basalts and slope gently to the southwest. 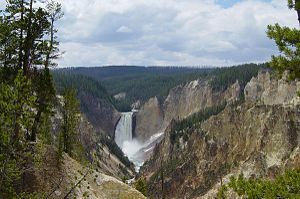 The major feature of the Yellowstone Plateau is the Yellowstone Caldera; a very large caldera which has been nearly filled-in with volcanic debris and measures 30 by 40 miles (50 by 60 kilometers). Within this caldera lies most of Yellowstone Lake, which is the largest high-elevation lake in North America, and two resurgent domes, which are areas that are uplifting at a slightly faster rate than the rest of the plateau. The park received its name from its location at the headwaters of the Yellowstone River. French animal trappers gave this river the name "Roche Jaune," probably a translation of the Native Hidatsa name "Mi tsi a-da-zi," and the later American trappers rendered the French name into English as "Yellow Stone." Although it is commonly believed that the river was named for the yellow rocks seen in the Grand Canyon of the Yellowstone, the Native American source name more likely derived from the yellowish bluffs located near present-day Billings, Montana. 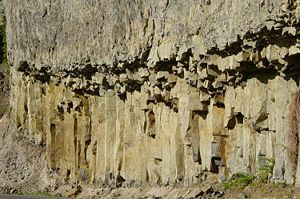 Columnar basalt near Tower Fall. Large floods of basalt and other lava types preceded mega-eruptions of superheated ash and pumice. Yellowstone is at the northeast tip of a smooth U-shaped curve through the mountains, which is now the Snake River Plain. This curved plain was created as the North American continent drifted across a stationary volcanic hotspot beneath the Earth's crust. Yellowstone Caldera is the largest volcanic system in North America. It has been termed a "supervolcano" because the caldera was formed by exceptionally large explosive eruptions. It was created by a cataclysmic eruption that occurred 640,000 years ago that released 1,000 cubic kilometers of ash, rock and pyroclastic materials, forming a crater nearly a kilometer deep and 30 by 70 kilometers in area (18 by 43 miles). The size of the caldera has been modified a bit since this time and has mostly been filled in, however. The welded tuff geologic formation created by this eruption is called the Lava Creek Tuff. In addition to the last great eruptive cycle there were two other previous ones in the Yellowstone area. Each eruption is in fact a part of an eruptive cycle that climaxes with the collapse of the roof of a partially emptied magma chamber. This creates a crater, called a caldera, and releases vast amounts of volcanic material, usually through fissures that ring the caldera. The time between the last three cataclysmic eruptions in the Yellowstone area has ranged from 600,000 to 900,000 years, but the small number of such climax eruptions cannot be used to make a prediction for the time range for the next climax eruption. The first and largest eruption climaxed to the southwest of the current park boundaries 2.2 million years ago and formed a caldera about 50 by 80 kilometers in area (30 by 50 miles) and hundreds of meters deep after releasing 2,500 cubic kilometers of material (mostly ash, pumice and other pyroclastics). This caldera has been filled in by subsequent eruptions; the geologic formation created by this eruption is called the Huckleberry Ridge Tuff. The second eruption, at 280 cubic kilometers of material ejected, climaxed 1.2 million years ago and formed the much smaller Island Park Caldera and the geologic formation called the Mesa Falls Tuff. 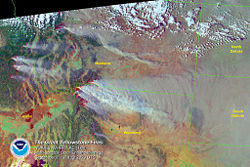 All three climax eruptions released vast amounts of ash that blanketed much of central North America and fell many hundreds of miles away. as far as California to the southwest. The amount of ash and gases released into the atmosphere probably caused significant impacts to world weather patterns and led to the extinction of many species in at least North America. About 160,000 years ago a much smaller climax eruption occurred which formed a relatively small caldera that is now filled in with the West Thumb of Yellowstone Lake. Lava strata is most easily seen at the Grand Canyon of the Yellowstone where the Yellowstone River continues to carve into the ancient lava flows. According to Ken Pierce, U.S. Geological Survey geologist, at the end of the last glacial period, about 14,000 to 18,000 years ago, ice dams formed at the mouth of Yellowstone Lake. When the ice dams melted, a great volume of water was released downstream causing massive flash floods and immediate and catastrophic erosion of the present-day canyon. These flash floods probably happened more than once. The canyon is a classic V-shaped valley, indicative of river-type erosion rather than glaciation. Today the canyon is still being eroded by the Yellowstone River. After the last major climax eruption 630,000 years ago until about 70,000 years ago, Yellowstone Caldera was nearly filled in with periodic eruptions of rhyolitic lavas (Obsidian Cliffs) and basaltic lavas (Sheepeaters Cliff). But 150,000 years ago the floor of the plateau began to bulge up again. Two areas in particular at the foci of the elliptically shaped caldera are rising faster than the rest of the plateau. This differential in uplift has created two resurgent domes, Sour Creek dome and Mallard Lake dome, which are uplifting at 15 millimeters a year while the rest of the caldera area of the plateau is uplifting at 12.5 millimeters a year. Two of Yellowstone's dome areas have been rising at an increased rate since 2004. The Mallard Lake Dome and the Sour Creek Dome have risen at a rate of 4 to 6 centimeters per year since 2004. 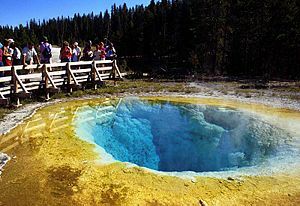 Preserved within Yellowstone are many geothermal features and some ten thousand hot springs and geysers, 62 percent of the planet's known total. The superheated water that sustains these features comes from the same hot spot described above. The most famous geyser in the park, and perhaps the world, is Old Faithful Geyser located in Upper Geyser Basin, but the park also contains the largest active geyser in the world, Steamboat Geyser in the Norris Geyser Basin. 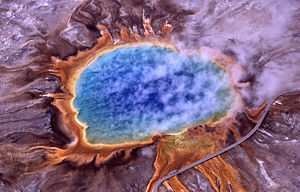 In May 2001, the U.S. Geological Survey, Yellowstone National Park, and the University of Utah created the Yellowstone Volcano Observatory (YVO), a partnership for long-term monitoring of the geological processes of the Yellowstone Plateau volcanic field. YVO maintains a website to disseminate information about research, plans, and events concerning the potential hazards of this geologically active region. In 2003, changes at the Norris Geyser Basin resulted in the temporary closure of some trails in the basin. This coincided with the release of reports about a multiple year USGS research project mapping the bottom of Yellowstone Lake that identified a structural dome that had uplifted at some time in the past beneath Yellowstone Lake. On March 10, 2004, a biologist discovered five dead bison which apparently had inhaled toxic geothermal gases trapped in the Norris Geyser Basin by a seasonal atmospheric inversion. Shortly after, in April 2004, the park experienced an upsurge of earthquake activity. These events inspired a great deal of media attention and speculation about the geologic future of the region. The U.S. government responded by allocating more resources to monitor the volcano and reminding visitors to remain on designated safe trails. The intervals between the historic large, caldera-forming explosions suggest that another such explosion may be due, if not overdue. 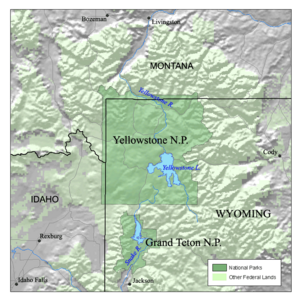 Greater Yellowstone is the last large, nearly intact ecosystem in the northern temperate zone of the Earth and is partly located in Yellowstone National Park. Conflict over management has been controversial, and the area is a flagship site among conservation groups that promote ecosystem management. The Greater Yellow Ecosystem (GYE) is one of the world's foremost natural laboratories in landscape ecology and geology and is a world-renowned recreational site. The great ecosystem concept has been most often advanced through concerns over individual species rather than over broader ecological principles. Though 20 or 30 or even 50 years of information on a population may be considered long-term by some, one of the important lessons of Greater Yellowstone management is that even half a century is not long enough to give a full idea of how a species may vary in its occupation of a wild ecosystem. Yellowstone is widely considered to be the finest megafauna wildlife habitat in the contiguous United States, with at least six hundred species of trees and plants found in the park, some of which are found nowhere else. The dominant tree species in the park is Lodgepole pine, however, varieties of spruce, fir and aspen are also common. In Yellowstone's hot waters, bacteria form mats consisting of trillions of individual bacteria. The surfaces of these mats assume bizarre shapes, and flies and other arthropods live on the mats, even in the midst of the bitterly cold winters. Scientists thought that microbes there gained sustenance only from sulfur, but scientists from the University of Colorado at Boulder discovered in 2005 that the sustenance for some species is molecular hydrogen—although there is evidence that this may not be the case for all of these diverse hyperthermophilic species. Animals found in the park include the majestic bison (buffalo), grizzly bear, American black bear, elk, moose, mule deer, pronghorn, bighorn sheep and mountain lion (puma). Rivers in the Yellowstone drainage comprise the core range of the cutthroat trout subspecies known as Yellowstone cutthroat trout, a fish highly sought by anglers yet one that has faced several threats in recent years, including the illegal intentional introduction of lake trout, which consume the smaller cutthroat trout; the ongoing drought; and the accidental introduction of a parasite which causes a terminal nervous system disease in younger fish, known as whirling disease. Elk are the most abundant large mammal found in Yellowstone; paleontological evidence confirms their continuous presence for at least one thousand years. When Yellowstone was established in 1872, market hunting of all large grazing animals was rampant. Not until after 1886, when the United States Army was called in to protect the park and wildlife slaughter was brought under control, did the large animals increase in number. More than 30,000 elk from seven or eight different herds summer in Yellowstone and approximately 15,000 to 22,000 winter in the park. Yellowstone is the only place in the contiguous United States where a population of wild American bison has persisted since prehistoric times, although fewer than 50 native bison remained there in 1902. Fearing extinction, the park imported 21 bison from two privately-owned herds, as foundation stock for a bison ranching project that spanned 50 years at the Buffalo Ranch in Yellowstone's Lamar Valley. Activities there included irrigation, hay-feeding, roundups, culling, and predator control, to artificially ensure herd survival. By the 1920s, some intermingling of the introduced and wild bison had begun. With protection from poaching, the native and transplanted populations increased. In 1936, bison were transplanted to historic habitats in the Firehole River and Hayden Valley. In 1954, the entire population numbered 1,477. Bison were trapped and herds periodically reduced until 1967, when only 397 bison were counted park-wide. All bison herd reduction activities were phased out after 1966, again allowing natural ecological processes to determine bison numbers and distribution. Presently, the park's bison population is estimated at about four thousand. The relatively large bison populations that exist in the park are a concern for ranchers who fear that the bison can transmit bovine diseases to their domesticated cousins. In fact, about half of Yellowstone's bison have been exposed to brucellosis, a bacterial disease that came to North America with European cattle and may cause cattle to miscarry. To combat the perceived threat, National Park personnel regularly harass bison herds back into the park when they venture outside of park borders. Animal rights activists maintain that is a cruel practice and the possibility for disease transmission is not as great as some ranchers maintain. Ecologists also point out that the bison are simply traveling to seasonal grazing areas that lie within the Greater Yellowstone Ecosystem that have been converted to cattle grazing. The mountain lion (also known as cougar), is the largest member of the cat family living in Yellowstone. Mountain lions can weigh up to 200 pounds, although lions in Yellowstone are thought to range between 140 and 160 pounds for males and around 100 pounds for females. The current population of lions in Yellowstone is estimated to be 18-24 animals and is thought to be increasing. Mountain lions were significantly reduced by predator control measures during the early 1900s. In 1987, the first study of mountain lion ecology was initiated in Yellowstone. The research documented population dynamics of mountain lions in the northern Yellowstone ecosystem inside and outside the park boundary, determined home ranges and habitat requirements, and assessed the role of lions as a predator in the ecosystem. In recent years in other areas of the West, mountain lions have occasionally attacked humans. No documented lion/human confrontations have occurred in Yellowstone. Beginning in 1918, in an effort to protect elk populations, the director of the National Park Service ordered “extermination of mountain lions and other predatory animals” in Yellowstone. By 1926 wolves were all but eliminated from Yellowstone. After the wolves were extirpated, the smaller cousin of the wolf, the coyote, then became the park's top predator. 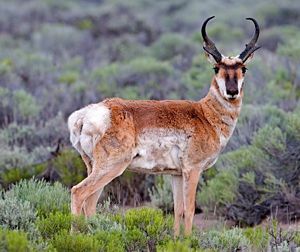 However, the coyote is not able to bring down any large animal in the park and the result of this lack of a top predator on these populations was a marked increase in lame and sick megafauna. By the 1990s, the Federal government had reversed its views on wolves. In a controversial decision by the U.S. Fish and Wildlife Service, which oversees threatened and endangered species, wolves were reintroduced into the park. Before 1994 there were no wolves in Yellowstone, there are now over three hundred of their descendents living in the Greater Yellowstone area. The National Park Service was generally not in favor of the reintroduction, citing evidence that wolves had already begun to return on their own, reestablishing themselves in very limited numbers prior to the wolf reintroduction. It was a quiet concern that the compact agreed on by federal agencies and the states in which Yellowstone is located would ultimately provide less protection to the wolf, because the threatened status would be amended to appease local interests such as ranchers who would not likely face prosecution under the reintroduction agreement. Cool, dry conditions limit Yellowstone's reptiles to six species and population numbers for these species are not known. Glacial activity and current cool and dry conditions are likely responsible for their relatively low numbers in Yellowstone. Known reptile species in the park: prairie rattlesnake, bull snake, valley garter snake, wandering garter snake, rubber boa, sagebrush lizard. The 1988 fires affected 793,880 acres or 36 percent of the park. Five wildfires burned into the park that year from adjacent public lands. The largest, the North Fork Fire, started from a discarded cigarette and burned more than 410,000 acres. A series of lightning-derived fires started to burn large portions of the park in July of the especially dry summer of 1988. Thousands of firefighters responded to the blaze in order to prevent human-built structures from succumbing to the flames. Controversially, however, no serious effort was made to completely extinguish the fires, and they burned until the arrival of autumn rains. 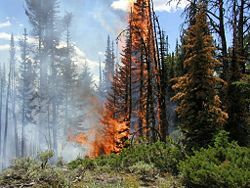 Ecologists argue that fire is part of the Yellowstone ecosystem, and that not allowing the fires to run their course (as has been the practice in the past) will result in an overgrown forest that would be extremely vulnerable to deoxygenation, disease, and decay. In fact, relatively few megafauna in the park were killed by the fires; and since the blaze, many saplings have sprung up on their own, old vistas are viewable once again, and many previously unknown archaeological and geological sites of interest were found and cataloged by scientists. The National Park Service now has a policy of lighting smaller, controlled "prescribed fires" to prevent another dangerous buildup of flammable materials. Yellowstone is one of the most popular national parks in the United States. The park is unique in that it features multiple natural wonders all in the same park. At peak summer levels, 3,500 employees work for Yellowstone National Park concessionaires and about eight hundred work for the park. Geysers, hot springs, a grand canyon, forests, wilderness, wildlife and even a large lake can all be found inside the park. Due to the park's diversity of features, the list of activities for visitors is nearly endless. From backpacking to mountaineering, from kayaking to fishing, from sightseeing to watching bison, moose, and elk wandering freely, visitors enjoy a memorable experience in nature. Park officials advise visitors not to approach dangerous animals and to stay on designated safe trails to avoid falling into boiling liquids and inhaling toxic gas. In 2004, five bison were discovered dead from an apparent inhalation of toxic geothermal gases. 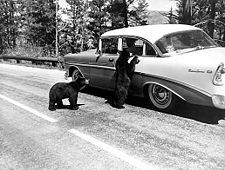 The park itself is surrounded by other protected lands including Grand Teton National Park and Custer National Forest and beautiful drives such as the Beartooth Highway. ↑ Historical Annual Visitation Statistics. Yellowstone National Park. U.S. Department of the Interior. Retrieved June 27, 2007. ↑ Joel C. Janetski, Indians in Yellowstone National Park (Salt Lake City, UT: University of Utah Press, 1987, ISBN 0874807247). ↑ Aubrey L. Haines, The Fur Trade Era (1818-42), ParkNet, National Park Service, U.S. Department of the Interior. Retrieved June 27, 2007. ↑ Aubrey L. Haines, The Folsom Party (1869), ParkNet, National Park Service, U.S. Department of the Interior. Retrieved June 27, 2007. ↑ Aubrey L. Haines, Cornelius Hedges, ParkNet, National Park Service, U.S. Department of the Interior. Retrieved June 27, 2007. ↑ General Grant National Memorial, National Park Service, Retrieved June 27, 2007. ↑ Mike Stark, “Yellowstone domes rising at 'really pronounced' pace,” Billings Gazette (December 15, 2006), Retrieved February 24, 2007. ↑ Yellowstone Volcano Observatory, U.S. Department of the Interior; U.S. Geological Survey. Retrieved June 27, 2007. Vazquez, Jorge Antonio. “Time scales of silicic magma storage and differentiation beneath caldera volcanoes from uranium-238-thorium-230 disequilibrium dating of zircon and allanite.” 2004. 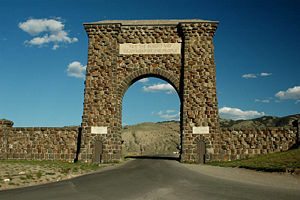 History of "Yellowstone National Park"
This page was last modified on 30 July 2013, at 17:31.